Building a healthy and safe work environment requires employees to have the skills and knowledge to identify hazards and avoid risks. Individuals must also value health and safety in order to make the right decisions, while strong policies, procedures and systems must be in place to safeguard workplaces. Health and safety risks such as disease and injury related to working in natural environments are addressed in our health and safety planning. Each of our operations follows SEMAFO’s Health and Safety Policy, which establishes requirements for suppliers and contractors to comply with our health and safety standards. Site-specific health and safety targets are defined annually as part of the management review element of our health and safety management systems. In 2018, in its first four months of commercial production, Boungou Mine recorded an injury frequency rate of 0.93 injuries per 200,000 hours worked. This is a strong result, particularly when benchmarked against the targeted rate of 2.0. In addition, a total of 5.6 million man-hours were worked without lost-time injury during the 18-month construction period of Boungou. 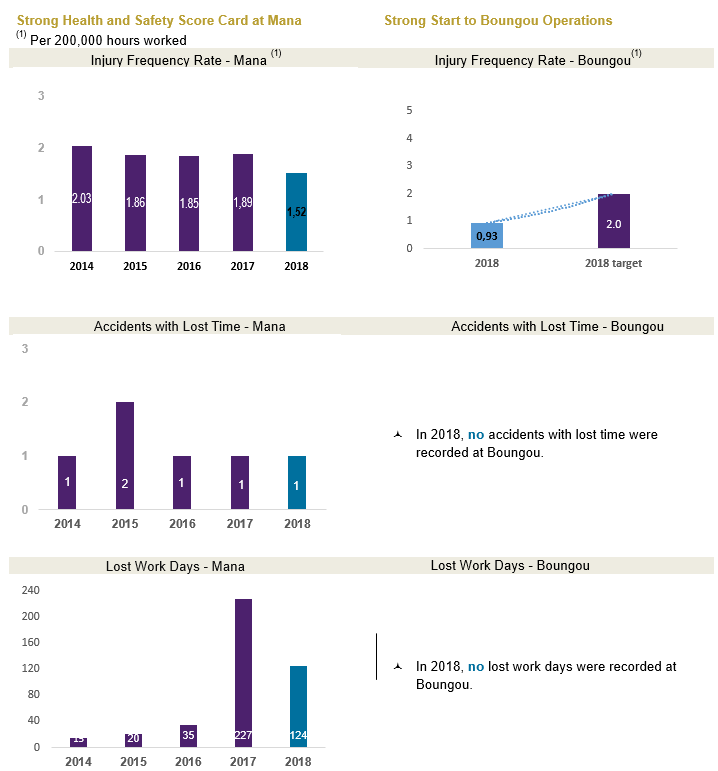 At Mana, the injury frequency rate fell in 2018 to 1.52, and the number of lost work days dropped at Mana to one. The 2017 increase in lost work days relative to 2016 is due to the severity of the 2017 accident. Our results at both mines are benchmarked against the industry average generated by the joint health and safety association for the mining sector in Quebec.